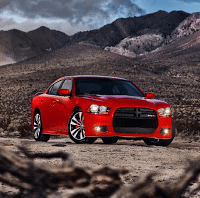 Finally, after months of waiting for a decent supply of cars, Chrysler/Dodge dealers are finally getting the 2011 model year Chargers and 300s they know they’re able to sell. 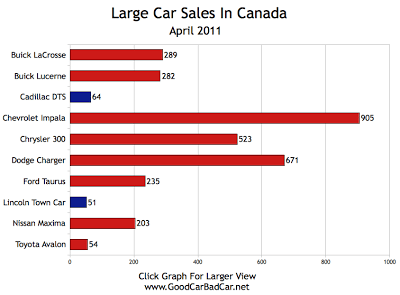 Considering the Caliber’s status as a rather unwanted hatchback and the Chrysler 200/Dodge Avenger duo’s capacity for improvement, the new versions of Chrysler’s profit-providing big sedans are more than a little useful at truck-dependent Chrysler Canada stores. 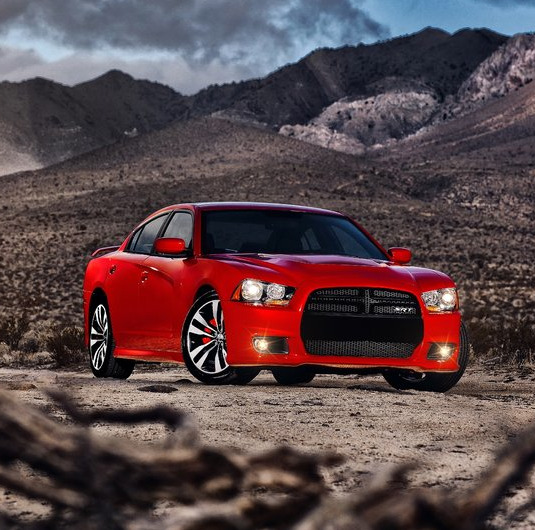 That said, April sales of the Chrysler 300 and Dodge Charger were down 6.4% and 4.6%, respectively. Together, however, they were Canada’s best-selling mainstream large car in April 2011. Speaking of room for improvement, don’t cast doubt on the possibility that the newish Chrysler 200 and slightly revamped Dodge Avenger could yet sell better. Canadians get Chrysler in a way Americans don’t seem to these days – it likely has a lot to do with prices – and the pair’s 64.4% month-to-month jump from March and preceding 179% month-to-month jump from February to March soothsays another bump in May. 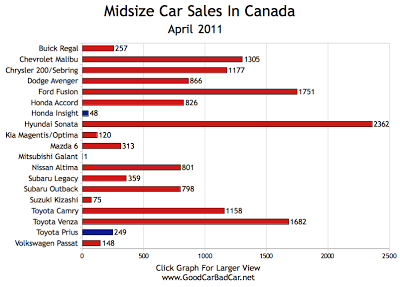 Separately, the Chrysler/Dodge midsize sedans are surely a fleet force; probably a retail factor. 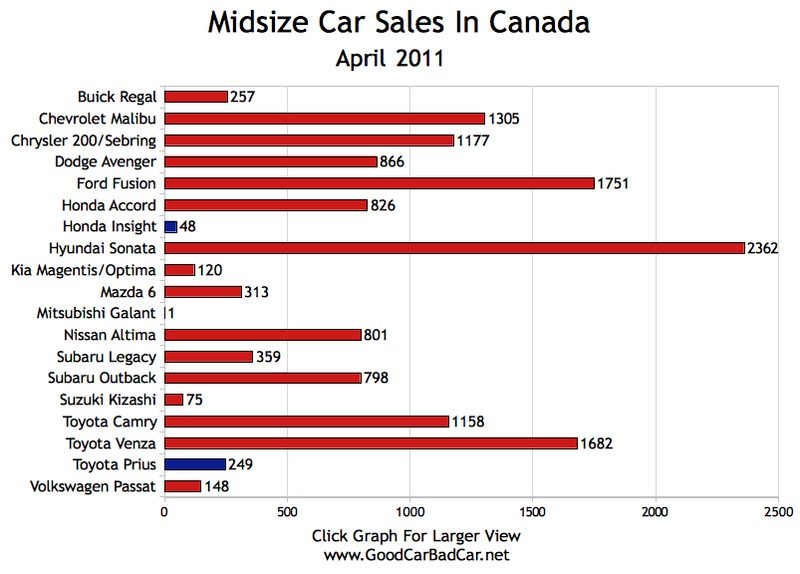 As a single unit, the Chrysler 200 and Dodge Avenger were out-sold by just one midsize sedan in April. Hyundai Sonata sales were up 70.4% to 2362. Auto123.com ran a story from the Wall Street Journal yesterday that shows the true pain of supply issues generated by Japan’s disaster triad is revealing itself at nerve endings across North America. A California dealer that would expect to sell 58 Toyota Corollas per month has received just one Corolla to sell in May. 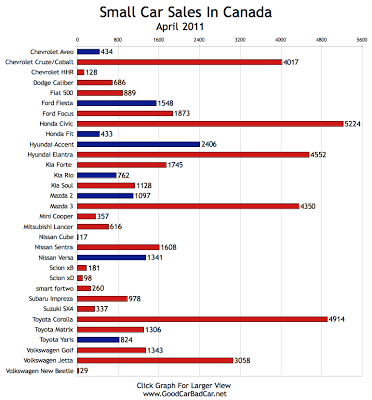 In other words, the small car chart you see at the bottom of this post could be radically transformed next month. 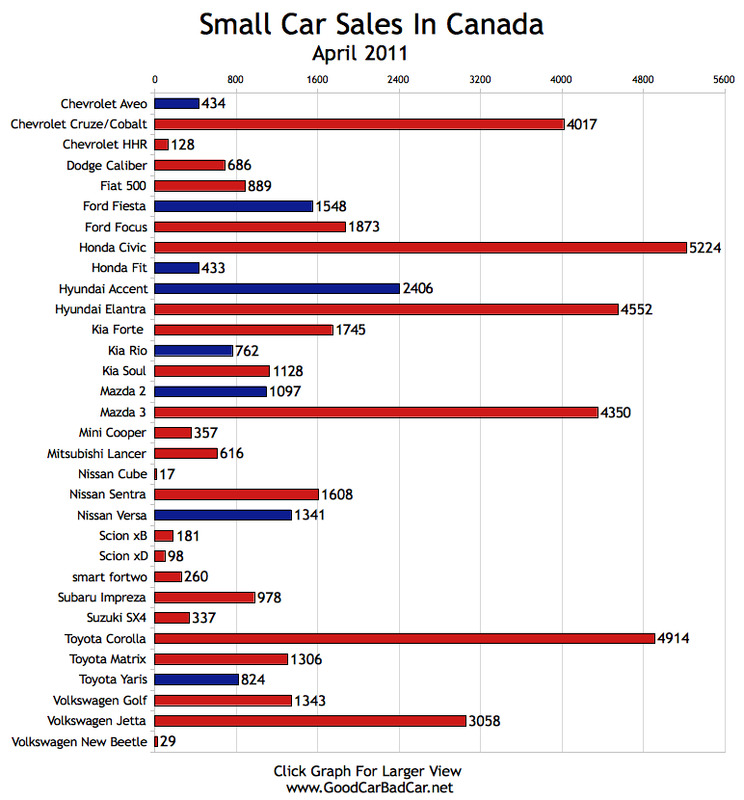 The Chevrolet Cruze pumped out nearly twice the volume Chevrolet’s Cobalt managed in April 2010. 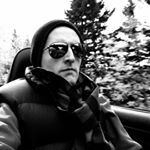 Though its sales improved by just 47 units year-over-year, a simple windshield survey (and hype calculation) will tell you that the 2012 Ford Focus is primed to take advantage of any lull at Honda and Toyota. Sales of the Honda Civic fell just 1.5% in April; Corolla sales increased 28.7%; Nissan Sentra sales climbed 9.6%; Mazda 3 sales fell 20%. From Korea-based Hyundai/Kia, Elantra sales were up 20.4% and Forte sales jumped 35.7%. By itself, the Hyundai Elantra Touring, with 1434 sales in April, would have beaten the Volkswagen Golf/GTI, Subaru Impreza, and Toyota Matrix.